(CNN) -- Michael Jackson, the show-stopping singer whose best-selling albums -- including "Off the Wall," "Thriller" and "Bad" -- and electrifying stage presence made him one of the most popular artists of all time, died Thursday, CNN has confirmed. 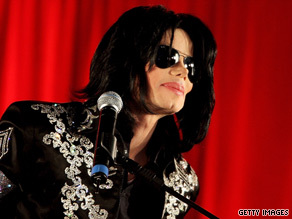 Michael Jackson, shown in 2008, was one of the biggest pop stars in history. "Michael Jackson made culture accept a person of color," the Rev. Al Sharpton said. "To say an 'icon' would only give these young people in Harlem a fraction of what he was. He was a historic figure that people will measure music and the industry by." His next release, 1991's "Dangerous," debuted at No. 1 but "only" produced one top-ranking single -- "Black or White" -- and that song earned criticism for its inexplicably violent ending, in which Jackson was seen smashing car windows and clutching his crotch. And then "Dangerous" was knocked out of its No. 1 spot on the album charts by Nirvana's "Nevermind," an occurrence noted for its symbolism by rock critics. After that, more attention was paid to Jackson's private life than his music career, which faltered. A 1995 two-CD greatest hits, "HIStory," sold relatively poorly, given the huge expense of Jackson's recording contract: about 7 million copies, according to Recording Industry of America certifications. Jackson, a natural performer, soon became the group's front man. Music critic Langdon Winner, reviewing the group's first album, "Diana Ross Presents the Jackson 5," for Rolling Stone, praised Michael's versatile singing and added, "Who is this 'Diana Ross,' anyway?" The group's popularity waned as the '70s continued, and Michael eventually went solo full time. He played the Scarecrow in the 1978 movie version of "The Wiz," and released the album "Off the Wall" in 1979. Its success paved the way for "Thriller," which eventually became the best-selling album in history, with 50 million copies sold worldwide. On the Motown Records' 25th-anniversary special -- a May 1983 TV extravaganza with notable turns by the Temptations, the Four Tops and Smokey Robinson -- it was Michael Jackson who stopped the show. It all happened very fast -- within a couple years of the Motown special. But even at the time of the "Motown 25" moonwalk, fame was old hat to Michael Jackson. He hadn't even turned 25 himself, but he'd been a star for more than half his life. He was given the nickname the "King of Pop" -- a spin on Elvis Presley's status as "the King of Rock 'n' Roll" -- and few questioned the moniker. But, as the showbiz saying has it, when you're on top of the world, there's nowhere to go but down. The relentless attention given Jackson started focusing as much on his eccentricities -- some real, some rumored -- as his music. As the Web site Allmusic.com notes, he was rumored to sleep in a hyperbaric chamber and to have purchased the bones of John Merrick, the "Elephant Man." (Neither was true.) He did have a pet chimpanzee, Bubbles; underwent a series of increasingly drastic plastic surgeries; established an estate, Neverland, filled with zoo animals and amusement park rides; and managed to purchase the Beatles catalog from under Paul McCartney's nose, which displeased the ex-Beatle immensely. At the time, the president and CEO of AEG Live, Randy Phillips, said, "He's as healthy as can be -- no health problems whatsoever."